Annual Island Cup rivalry game against Nantucket cancelled this year. Faced with a football roster depleted by injuries and disciplinary dismissals, Martha’s Vineyard Regional High School administrators decided Thursday to forfeit the end of the varsity football season, including the Island Cup against rival Nantucket High School. The Vineyarders will end the season Friday evening with their ninth game of the year, Senior Night, against Greater New Bedford Vocational Technical School. With a record of 1-7, the team’s only win this year came against Atlantis Charter School, which forfeited its scheduled Sept. 22 game against the Vineyarders because it didn’t have enough players to field a team. Athletic director Mark McCarthy said the decision came after discussions this week with first year head coach Ryan Kent and principal Sara Dingledy. A total of 36 students tried out for football at the beginning of the year. That was not enough players to field both a varsity and junior varsity squad, so the school decided to curtail the junior varsity season. This week, the team was down to about 20 players, with six of the youngest players on the roster who would not be expected to play. Coach Kent said the main reason for the decision to forfeit the last two games was because of injuries, although there also were some players suspended or dismissed for disciplinary factors. The head coach said forfeiting the Nantucket game was especially difficult. Coach Ryan met with the Martha’s Vineyard Touchdown Club, the Island’s football booster organization, Wednesday evening. “There are a lot of parents in the booster club, and they were visibly upset, but they were understanding,” said Louis Paciello, president of the club. Fielding football teams has become increasingly difficult for small schools like the Vineyard regional high school, as the popularity of the sport wanes compared with other high school sports. 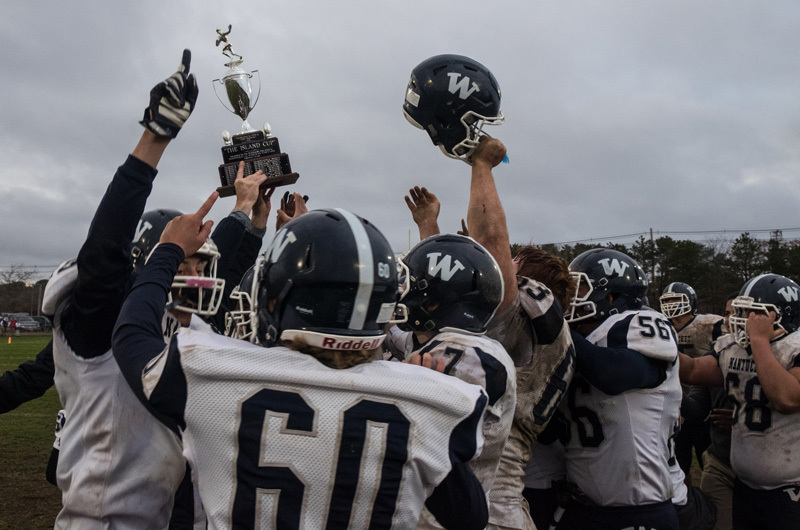 The only other time the Island Cup was not played since the inception of the Vineyard-Nantucket football rivalry was in 2009. That year, Nantucket declined to schedule the season finale game following a year when the number of players on the Nantucket team dwindled. Mr. Paciello said this week’s developments came as no surprise to him, since the team started with about half the number of players that once filled out the high school football rosters. Mr. Paciello said he is concerned about the viability of the high school football program, and has been for some time. Mr. McCarthy said the football program has gone through cycles over the years. He pointed out that after a trying phase in the 1980s, the team regained popularity and won five state championships. The athletic director said he will develop a plan to make sure the discouraging end to the 2017-2018 season does not lead to a further downward spiral next year. This is a sport that simply doesn't need to exist. It's not really a test of athleticism, and as overwhelming research has shown, is extremely harmful to the brain of the adults who play professionally, what it does to the brains of developing teens is likely even worse. Why even bother with it in this day and age? Agreed. It's just too dangerous. The school and coaching staff did the right thing for the safety of the kids. Perhaps the two islands should consider a different format, one that honors all sports and athletes. Could there be a day where all fall teams competed? Is there enough field space? Maybe start at 11:00 AM? Could the Cup go to the school that had the most victories? I have 3 daughters that each play soccer, basketball and lacrosse. Injuries are a part of the game. Girls soccer has a higher rate of concussions than football. Sports are about building relationships, dealing with adversity and developing character. As a former football player, I wouldn't take 1 second of the memories / moments away. Football is a game that should be cherished. Nothing brings a community together like it. My 2 best friends are guys I played with 25 years ago. We've been one another's best man / godparents for our children. We take family vacations together and now our children have become great friends. There's something special about it. Unless you've done it, you will never understand it. Nantucket has gone through the same issues with participation. Currently our numbers are up. We understand the problems and wish the Vineyard the best and hope to see them on the field next year. Tim, I am sad as this is the only time I get to see my friend of more than forty years and I will miss you. The Nantucket team always boos when I walk over to their side looking for you. Sorry, I wear purple quite often. Guess it is time to visit you on a warm summer day on Nantucket. Peace ! I coached on the 2009 team that forfeited to the Vinyard and understand the situation all to clearly. Best of luck in years to come. Respect..
Smart decision. Player safety come before all other priorities. Good luck MVHS, its a challenge at many schools, hope the program rebounds and the kids and coaches get on the gridiron again. Good decision by MVHS. I'm confident they will resurrect the program. They must build from the ground up. Playing in a smaller conference should provide more competitive games, which will hopefully result in more players. This is an extremely difficult decision for everyone. I feel awful for the seniors. They deserve better. They obviously have a supportive administration and booster club. I find Mr. Paciellos comments to be right on target. Let's hope he can inject some much needed momentum into the program. I may some heat for this, but sports should be viewed as a guidance program. Mr. Paciello made some comments regarding drugs and alcohol. I'm not a fan of throwing kids off the team for making mistakes that many have made. Young people need consistency and support. Throwing them off the team does nothing more than give them 3 extra hours a day to make poor decisions. If not for sports I never would've stayed away from drugs and alcohol. I feel bad for the kids that have participated all year and there season is cut short. With that said, I have a son that knows his parents will never allow him to play football. We accept that injuries can occur in any sport (or life) but the cranial impact from football is an unnecessary risk. 4 years of a high school team, playing a game, doesn’t out-weigh the need for a healthy functioning brain needed for the rest of his life. To the best of my knowledge no kids were kicked off the team for behavior issues. Student athletes were disciplined for MIAA infractions based on MIAA rules. Other infractions were handled just as you described; with the goal of teaching responsibility and accountability. I agree Cindy. We must teach the children accountability and taking responsibility for ones actions. Wow what a terrible circumstance for the island community to have to deal with. I hurt for the players most of all. I was honored to be captain of the 1968 Vineyarders football team. As a retired teacher, principal, and associate superintendent in the south (where football is king) I have attended hundreds of HS football games. Many of those games were exciting. However most can agree that nothing compares to playing football on the Vineyard. It is a venue like non other. In my entire 35 year career I never took a Ferry Boat ride to watch a football game. But...my administrator hat says they did what they had to do to protect students and we all should respect that. But my guess is that if I’m a young student athlete I will need some time to agree with the decision...if ever. Vineyard football will return strong. In the story they mention "trying times in the 80's".. there where NO TRYING TIMES..we had great student athletes that did there school work and played hard football.. things where much more competitive back then, so if you had a winning record you earned it.. get your story right!! I guess coach Don Herman was MV football. I hope hes doing well. For those that don't know, Beau Almodovar was not only a coach on the 2009 Nantucket football team, he is also the best player they have ever had. Their current head coach could take a lesson in humility from a very humble man. I get all the above. What I don't get is the timing. If all the above reasons are true then why continue to play another game? Why not have an Island Cup game of seven on seven flag football? It's better than not having anything at all. The players could have some fun, the fans could have some fun and the tradition would continue. How did they play last night, but not able to play Nantucket?